A sneak preview of some earrings I'm working on. Along with these adorable little butterflies (taken from vintage botanical prints) are vintage map, music, postal, flower & bird earrings - many with bracelets and necklaces to match. The above are teeny tiny at 12mm diameter but I also have a whole range of larger 16mm diameter euro wires and a few 'clip ons' too for those without pierced ears. 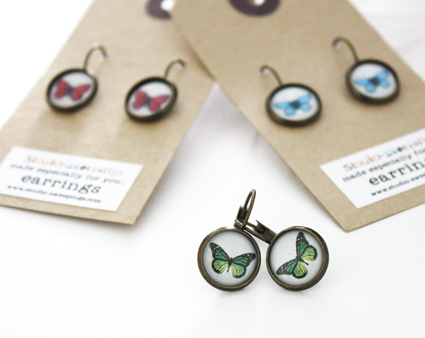 I am hoping to launch the entire new studio-sweepings jewellery range very soon. The products themselves are now finalised - but I still have work to do on packaging, labelling and lots of photos to take. Once I've worked all this out and written the blurb (phew!) they will be for sale on line.